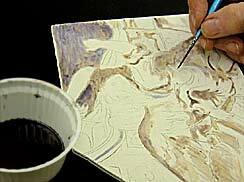 Since tempera is a uncompromising technique and the design cannot be changed once it's sketched onto the panel, planning the entire composition ahead of time is essential. 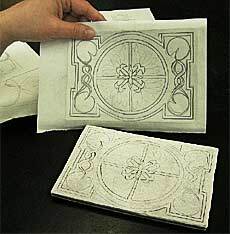 Begin by working out the entire design in pencil on tracing paper (either freehand or from another source). You should end up with a complete outline of the image drawn to fit the prepared panel. 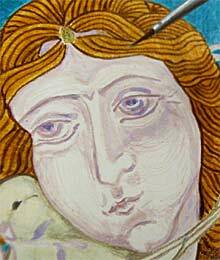 Make sure that all details are as finalized as possible, since erasing lines on the panel can mar the gesso surface. Once you're satisfied with the design, turn the tracing paper over and use a soft pencil to retrace the outline of the design. Then, position the paper right side up over the panel and secure it with masking tape (to the rear of the panel) to prevent it from shifting. Then retrace the image with a pencil (or firmly rub a straightedge over the tracing paper) in order to transfer the image outline onto the gessoed board. Before removing the paper, release one side of the drawing and check to make sure the outline is completely transferred. laying down thin glazes of color, it's important to first model the areas of shadow in the image with a thin wash of ink that will help create a wider range of values in the completed picture. the tip of the brush, as if you were doing a pencil drawing, and, brushstroke by brushstroke, building up areas of both lighter and darker shadow. Make sure to leave some areas in a middle tone and others in a darker tone, keeping the modeling soft, so that the shapes can take form gradually. The deepest shadows can be darkened by adding more coats of ink, and, if necessary, by adding a bit more ink to the water when painting the darkest areas of the design. This modelling of the shadows, which will subtly show through the paint, will have a significant effect on the values and saturation of the final colors.